A full week of economic reports is ahead, with news on manufacturing, housing, inflation, and more. In manufacturing news, the Empire State Index will be released on Monday with the Philadelphia Fed Index being delivered on Thursday. Housing data will fill the airwaves this week with Housing Starts and Building Permits on Wednesday and Existing Homes Sales on Thursday. Weekly Initial Jobless Claims will be released as usual on Thursday. The numbers have been ticking down as the impact of Hurricane Sandy has subsided. Also on Thursday, look for the Gross Domestic Product Report. It will be interesting to see if the third reading for the third Quarter of 2012 will remain at 2.7% or if the figure will be revised lower. Friday’s data includes the inflation-measuring Core Personal Consumption Expenditures. Inflation has been tame and the Fed believes this will be the case for the foreseeable future. Rounding out the data on Friday, Personal Income and Spending will be released along with Consumer Sentiment. When you see these Bond prices moving higher, it means home loan rates are improving – and when they are moving lower, home loan rates are getting worse. To go one step further – a red “candle” means that MBS worsened during the day, while a green “candle” means MBS improved during the day. Depending on how dramatic the changes were on any given day, this can cause rate changes throughout the day, as well as on the rate sheets we start with each morning. As you can see in the chart below, despite the tame inflation news, Bonds and home loan rates worsened slightly due to added selling supply in the markets and an improvement in Stock prices. 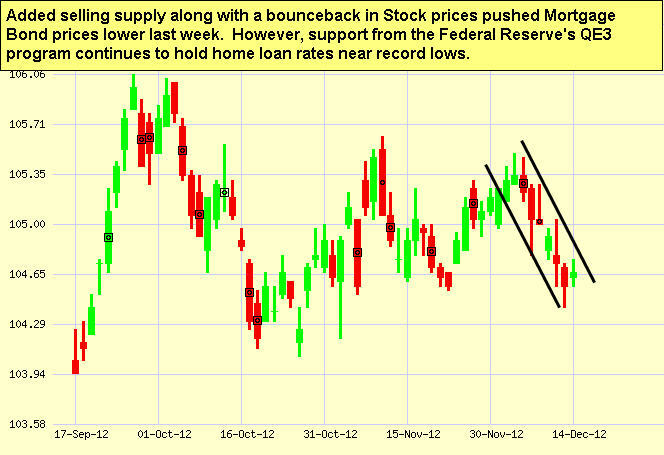 However, Bonds and home loan rates remain near record best levels and I will continue to monitor them closely. We all know that people follow the lead of credible and knowledgeable experts. It’s why professionals put diplomas on their wall, car commercials mention their awards, and testimonials appear in advertising. If you go around tooting your own horn to new prospects, however, you can wear out your welcome fast. Dr. Robert Cialdini, Professor Emeritus of Psychology and Marketing at Arizona State University and author of the bestselling business book Influence: The Psychology of Persuasion, discovered if someone else “toots your horn,” even if they don’t have any expertise themselves-and even if they have a financial interest in making the recommendation-prospects are favorably influenced regardless. Here’s a simple strategy you can employ. Whenever a call comes in requesting a particular service, have your receptionist briefly mention your qualification or expertise before transferring the call. Even something as simple as, “Let me transfer you to Bob, he has 20 years of experience in that area,” can make a difference to potential clients. According to Cialdini’s research, one company used that very script and they saw a surprising 20% rise in the number of appointments and a 15% rise in signed contracts. Not a bad return on investment! While it’s important to explain why you’re a credible authority, it doesn’t always have to come from you. Try this technique out for yourself, and then share it with other professionals in your referral network.